The Garage door remote is a great way to operate your garage door and look like a magician to your kids at the same time! It’s also useful for handicapped persons, or persons with limited strength. It sounds great, but how does it work? Easy! We come to your home and install the garage door remote sensors and attach those to your garage door opener. Then we program a small garage door remote control or two that can fit on your key chain. Those remotes allow you to open and close your garage door as if you were powering on and off a television. Garage door clickers can come in different shapes and sizes, but they all function the same way. Garage Doors Edmonton can provide professional garage door remote clicker services in Edmonton including installation, replacement, and repair. For our customers who own multiple garage doors, we offer a universal garage door remote that can control all of them! If you have a preexisting garage door remote system, we can offer replacement for all the parts involved. Such services might include garage door remote replacement or garage door opener remote replacement. Edmonton Garage Doors will make sure that any replacement is performed accurately for maximum functionality. Garage Doors Edmonton is proud to offer garage door remote control services at affordable prices throughout the Edmonton area. We can ensure the quality repair, replacement, or adjustment of your garage door remote control openers. Your satisfaction is our number one priority and we’ll work hard to earn it. 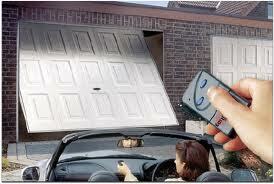 Look no further than Edmonton Garage Doors for all of your remote needs! Our professionals have tons of experience and are always ready to help you. We provide a wide range of services that will ensure you have a remote you can trust to work when you need it to do so.